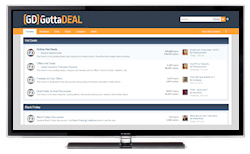 Getting the best deals online is what GottaDEAL is most known for. 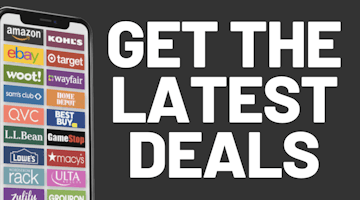 Before we ever started our comprehensive Black Friday coverage each autumn, GottaDEAL was - and still is - a year-round online deals site. Therefore we can give you our expert advice when it comes to getting the most and best online deals the week of Black Friday. Due to the changing start times for Black Friday sales in physical stores, we've been getting many questions about online Black Friday shopping on our message boards and Facebook page as more people than ever will be shopping online this year. To help everyone out, we've put together a set of tips that can help you have a successful Black Friday week online. TIP #1: Use the tools on GottaDEAL - The number of online Black Friday can be simply overwhelming. There is no possible way you can keep track of everything on your own, so we've put our expertise into creating a few useful tools for you. The most important is our Online Black Friday Tracker. Bookmark this page. Check it often. It will be your best friend for a few days. This page will list all of the important online Black Friday sales with information such as starting days & times, sale details, any coupons to save you extra cash and much more. This page will also keep a running count of all the Black Friday ad items that you can order online right now, at the Black Friday ad price. Use this page. Share it with people you know. Another very useful part of the site is our dedicated Online Black Friday Sales sub-forum on our Black Friday message boards. This is where you can get live updates on the sales from your fellow shoppers, ask any questions you may have, find out about last-minute changes to the schedule of sales, share the deals you've found and much more. The Black Friday home page will also post updates about when stores put their Black Friday sales online. Either keep checking the site, or sign up for our mailing list and we'll send e-mail blasts when items go online. You can also get update via our Twitter account and our Facebook page. You can choose how you'd like to be updated and we'll do the rest. TIP #2: Wednesday night is prime time this year - While retailers moving the start of Black Friday to Thanksgiving Day has made headlines in recent years, for those of us doing our Black Friday shopping online, the big day to start shopping is actually one day early - on the day before Thanksgiving. The Wednesday of Black Friday week has become the hottest online shopping day of the year for elite deal hunters and for good reason - it's the day that most of the bigger retailers will put their Black Friday ad items online. By Thanksgiving morning, many of the best deals will already be sold out. TIP #3: Prepare your online retailer accounts - This can be done at any time between now and the start of the sale, although we suggest you do it as soon as possible. Go to each web site for the stores you plan to shop at this week and make sure your shipping and billing addresses are up to date. Also make sure your credit card information is saved. Having this information saved means you won't have to waste time entering it and risk items going out of stock once the sale is live. If there is a site that you might shop at that you don't already have an account for, now is the time to sign up for that account. This can be especially useful as a few online stores will offer an introductory discount to first time customers. TIP #4: Adding items to your cart in advance - Be aware that this tip does not work for every site out there, so keep that in mind. However, in many cases, you are able to add Black Friday sale items to your shopping cart (make sure you are logged in so they are tied to your account) and once the sale has started, you can refresh your cart and the sale prices should change. You can find links to most of the Black Friday ad items for the major stores on our Black Friday site - just choose a store from the left-hand column. Note that some sites will have special item numbers for Black Friday ad items, so if the prices in your cart do not change once the sale has started, you will need to find the new item page and add it again. Another option is to have separate windows open on your computer for each product you are looking to buy. Once the sale starts, quickly refresh each, make sure the sale has updated and then quickly add it to your cart and proceed to checkout. Having the product pages open ahead of time will save time and you won't risk items you previously added to your cart mysteriously disappearing once the sale starts. You can also try using different browsers (Firefox, Chrome, Edge) open to have backup(s). TIP #5: Be aware of free shipping offers - One of the best parts of online Black Friday shopping (aside from not having to deal with the chaos in stores) is getting your items shipped for free. Each retailer has a different shipping policy - some, such as Target and Best Buy this year, offer free shipping on absolutely everything. For stores like these, if there are items you really want and others you are merely just thinking about, order the important items first and then go back to browse for other items. You won't have to worry about combining items into one order to qualify for free shipping, so lock your order in as soon as possible and then go back. For other stores, such as Walmart and Kohl's, there is usually an order total threshold that you must reach to get free shipping. If you are done shopping and do not qualify for free shipping, check how far away you are from reaching that amount. In some cases, you are better off just adding another item to get free shipping rather than paying the shipping charges. You can always return the "extra" item later and you'll still get the free shipping. TIP #6: Use coupons & discounts to make deals even hotter - You can improve the already sizzling hot Black Friday deals by using online coupons. 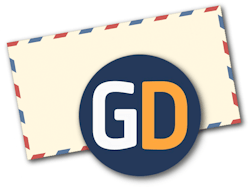 Here on GottaDEAL, we have a huge coupon section with codes and discounts for all your favorite online retailers. For example, we have a 15% off coupon for Kohls.com - all of these coupons are valid on Black Friday along with hundreds more on the site. Using these tips and the exclusive online Black Friday shopping tools you'll only find on GottaDEAL will put you in a position to have a very successful Black Friday shopping experience online. And if you have any questions, feel free to contact us through the site and we'll do our best to help you out.